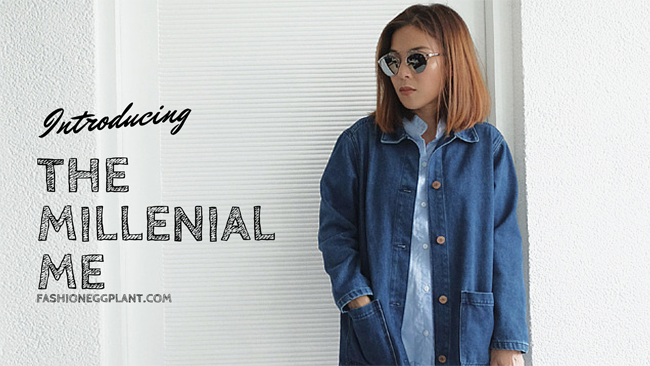 When I popped into a Uniqlo event in this outfit, the first thing one of my friends said was "lakas maka millennial!" That of course sent me over the moon and up on cloud 9. Yes, that deserved 2 idioms, especially when you're 36 like me. I purchased this entire outfit in Kuala Lumpur while I was there to promote tourism during the Malaysia Shopping Hunt. Oh my god, can I just say that KL is like THE BEST SHOPPING DESTINATION in SouthEast Asia! I always considered, Hong Kong as the go-to for shopping but after this trip, hell no. I was there with Lissa Kahayon for about a week. It was work so I wasn't planning on spending much money but hey ho, with the official Malaysia Tourism people and the best tour guide I've ever encountered (ask me for his contact info, if you need one) showing us the best places to shop everyday for a week, our wallets and credit cards were fighting a lost war. Lissa is the best (or worst) shopping partner ever. Depends on what you need. What I'm saying is that she is very encouraging. Hahaha, much like me. Add those 2 elements and BOOM! But you know, despite the drought in my wallet. I've no regrets. I love every single thing I bought and also....EVERYTHING IN KL is super cheap compared to here and HK. That's at regular retail with no discount. Especially Adidas, for some reason, Adidas there is cheaper by around 2k/shoe. Add GST + tourist discount + a lower base retail price and you end up with merchandise that is easily 30-40% cheaper. 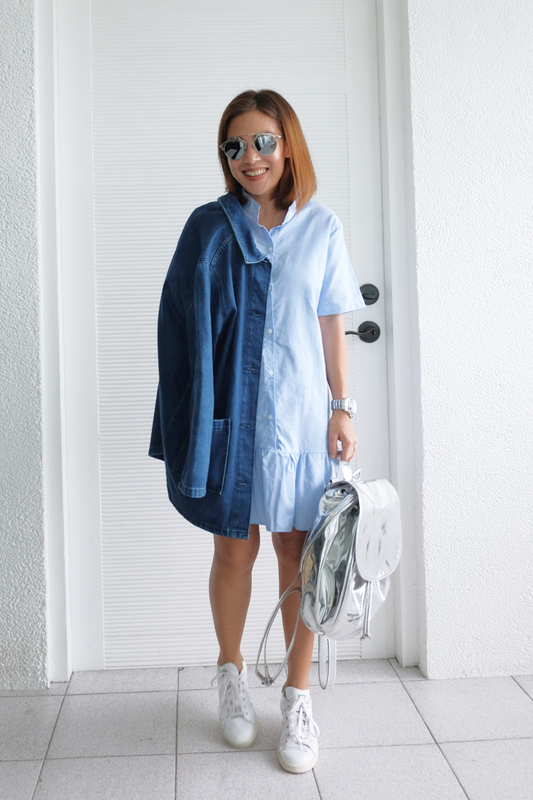 This cotton shirt dress was locally made and I purchased it from a small boutique similar to those found in Greenhills. The boxy, oversized denim jacket and silver backpack is from MONKI - a sister company of H&M and also where most of my money went. I LOVE MONKI! I shot this sometime last month I think...nowadays I wouldn't even dream of touching this jacket, but I do miss it. I can't believe how high the temp has managed to go up over the course of a few weeks...phew! So if you're looking for some serious retail therapy this summer plus a new exotic place to spend it at, KL is my top contender. Will share a more in depth guide about shopping in Malaysia soon. In the meantime, feel free to message or email me with your travel questions. I'll be happy to help you out. That powdery blue dress is adorable! I've never been to KL, but I do love shopping. Maybe I'll get to visit one day. I love the cotton dress. Thanks for the tip, I'll remember this when we visit Malaysia. My husband is actually going to KL in a few months, maybe I'll send him over some money haha. First thing I notice is the tan. Ganda! :) And the whole outfit really looks good on you. Uyy!!! We were born in the same year. But I wouldn't have guessed. You definitely look younger! hahaha, the secret is thinking young to feel young = look young? haha and lots of skin cream?! thanks anne! super cheap to go to kl, mga 100usd lang airfare roundtrip na, food is affordable and fantastic too! First, you just look like you are in your 20's! :) I love your get up and I will definitely keep in mind what you have mentioned about KL! I was born the same year, but you look way younger! What is your secret?! Hehe! I love this ensemble, especially the pair of Stan Smith. Now I wonder when I can go to KL to get a pair for a much cheaper price!